Since the logarithmic plot of Figure Nine was beneficial in separating the data I decided to replot Figure Five on a logarithmic scale for the absolute side deviations and with separation of the individual data points in each structure against the polar orientations, Figure Eleven. This more clearly shows the small base length differences as a function of geographical orientation. This graphical plot is even more remarkable than the extraordinary results thus far discussed. Six data points for the sides of each structure with the least deviation, except for the Bent wall, are scattered closely on either side of a straight line on the logarithmic plot. The north side of Meydum also falls on this line. The only point with any significant difference from this generalization is that of the Best Wall South side. Maragioglio noted the probably error in the 38' 50" value for this side. From this graph we can now suggest an answer to that error. A double scribal mistake probably transcribed a “2" as a “3, and a “3" as an “8.” If the value were 23' 50" it would fit on the graph at the band limits defined by the other data points. How regretful that we do not have data from the Bent and Flat pyramids. One can see the “open” space in this band where the Flat and Bent data would probably fall. We noted this also with Figure Nine. Note that this band is slightly more than one order of magnitude. They are mathematically real. Anyone can confirm their placement on the graph. Are they unique? Are they the one and only solution to the scatter of the data points? where Pi and e are the permeability and permitivity of the space-time plenum. The more we study the ancient Egyptian pyramid design the more we become impressed with the true genius of the designer/construction engineer. The nonrandom grouping of the data on Figure Eleven can be examined by the use of histograms, Figures Twelve A, B. and C.
If we take the absolute side deviations and plot them on a linear scale of twenty divisions we obtain Figure Twelve A. The deviations are clustered close to zero, as we would expect for random variations in control, perhaps as a normal distribution. From this histogram we might estimate how well the builder held to the mean base lengths, without any ulterior motive in their scatter. If we took this view we would make a mistake of such proportions we would entirely miss his design objectives. If we look broadside into Figure Eleven from the logarithmic scale, with twenty equal divisions, we obtain the histogram of Figure Twelve B, extending from 2 parts /100,000 to 2 parts /1,000. This gives almost a linear distribution on the logarithmic scale. Clearly, this does not follow a normal distribution of random errors around the mean base lengths. But again, this does not tell the whole story. While it might alert us to something peculiar in the control of the pyramid side lengths we would not fully perceive the arrangement of the data. Only by a full display of the data can we come to better grips with the design intent. If we plot the data points as they are grouped orthogonally across the regression band of Figure Eleven, with twenty-two equal divisions, we obtain the histogram of Figure Twelve C. Now it becomes more evident that the data cluster into three main groups, with two at the upper and lower band limits and one at the midpoint of the band. Only three points on the positive side do not fall in these clusters. The clusters confirm that we have found a nonrandom relationship among the data. In any grouping of data we can manipulate the display to show relationships, a practice at the roots of scientific inquiry. From such displays we then develop theoretical models. If the models are specific we can derive mathematical equations to more explicitly define them. In this case we have demonstrated that the logarithmic plot reveals a bona fide relationship among the IVth dynasty structures. The patterns are so clear we can formulate precise mathematical expressions. The slopes seem innocent enough until converted to radian measure, when the lower becomes 1000/2Pi per radian to the common base 10, within 5%. The upper slope is 1000/Pi (2000/2Pi) per radian to the natural base e, within less than 1%. Furthermore the intercepts are also less than 5% from an ideal of 1/2Pi for the lower and about 2% from an ideal of ln10 for the upper. Note that the intercept ln 10 is associated with the natural base while the intercept l/2Pi is associated with the common base. The upper calculated regression line is so close to the theoretical line we cannot distinguish them on the plot. 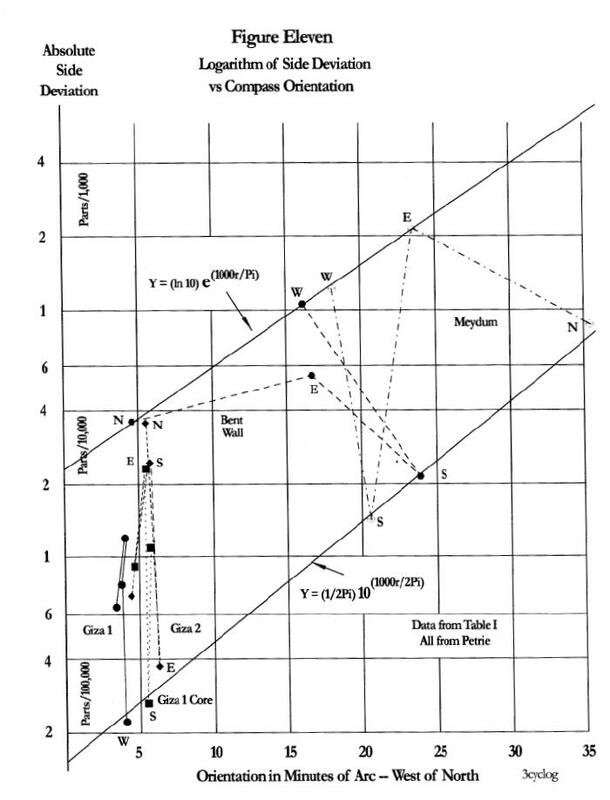 The lower calculated regression line would also fit on the theoretical line if only one data point, the Meydum north side, were in error by 2 parts/10,000 or 3 centimeters. If the side lengths and orientations were consciously chosen by the architects consider how the pyramids were placed in their mean positions, and in their individual side positions. If the mean polar orientations were skewed more from the north the data points would fall farther to the right on Figure Eleven. If the mean side deviations were larger the data points would fall higher on the plot. The mean positions determine a centroid for each structure, and the centroids determine the form of Figure Five. They also determine the relative positions of Figure Eleven. Individual data points then locate around the centroids. The core and the case for Giza 1 do not have side deviations that reach the upper regression line of Figure Eleven; there is a limit on their maximum deviation to achieve their mean deviations. If their mean side deviations were too high it would upset the linear form of Figure Five. Therefore, only the lower data points, those sides closest to the mean, could be used to determine the lower band limit of Figure Eleven. (Assuming that design criteria kept all data points inside the two band limits.) Giza 2 had sufficient mean side deviation to permit one of its sides to help define the upper band limit of Figure Eleven while also helping to define the lower band limit. The Bent wall is curious in that it is opposite to Giza 1 in placement on the graph; two of its sides help define the upper band limit. 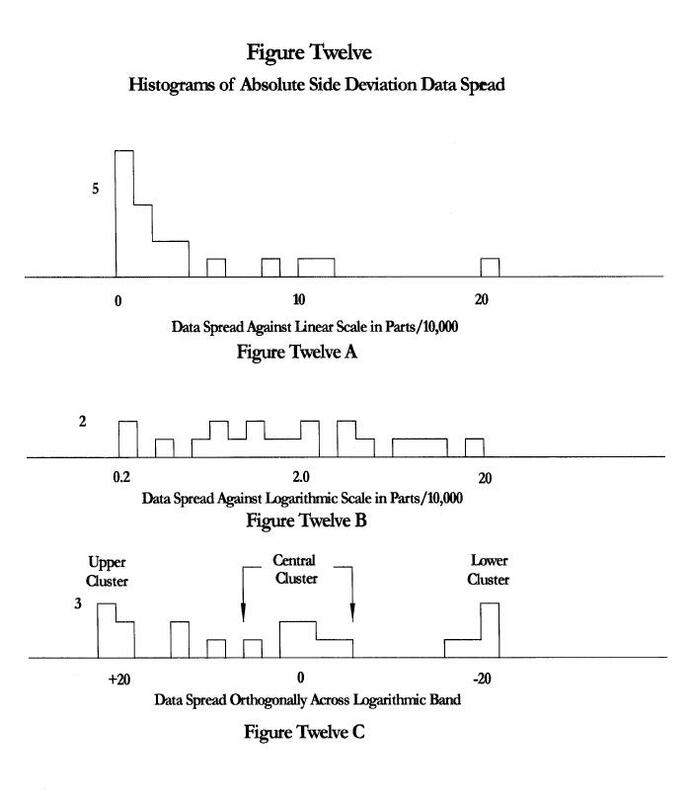 Since the lower band limit is about an order of magnitude lower than the upper, a data point falling on it has little effect on the value of the mean deviation.